The iconic Garden Shed! Making your life easier and your home cleaner! For Aussie families, it’s a place to store our most prized possessions and hide the eyesores. Additionally, it’s a place to keep chemicals and tools our of reach from little hands and paws. It is also a place to keep our toys, bikes, bins and tools safe and secure. At Spanbilt Direct, garden storage solutions are our speciality! We have been manufacturing steel buildings for many years, and have grown to become a leader in the Australian market. We offer a HUGE range of designs and sizes to ensure we have a garden shed to suit all property types. 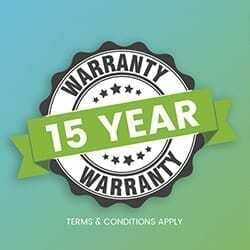 Our garden storage solutions are backed with 15-year warranty, and we can deliver Australia wide or you can select to Click and Collect. Get your Spanbilt Direct Garden Shed today! When it comes to backyard storage, Spanbilt Direct offer an array of garden storage shed designs that can fit into any backyard, no matter how big or small. We have small compact sheds through to your larger garden shed designs. Buying your garden shed online with Spanbilt Direct is a simple and painless experience, simply select your shed, select the colour and add to cart. You can pay by credit card, over the phone or in 4 x easy instalments with OxyPay. Spanbilt Direct offer Home Delivery (at an additional charge) or a FREE Click and Collect service. Most importantly, all of our garden sheds are made using high tensile Australian standard steel and are backed by a 15-year structural warranty. Buy your Garden Shed online today with Spanbilt Direct.